Terraces like those of Baishui are one of nature's most remarkable creations. The formations vaguely resemble a frozen cascading series of short waterfalls - and the wet terrace walls have a white jade like glow. The terraces gradually formed over hundreds of thousands of years. Running spring water rich in bicarbonate calcium left behind the calcium sediment that built the terrace walls and basins molecule by molecule. 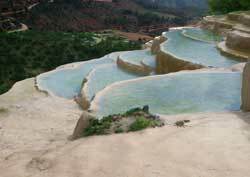 Calcium is white, but the terraces of Baishui are creamy white and sometimes streaked yellowish brown. Reason: The flowing spring water deposited other dissolved minerals besides the calcium. The half-circular pools of water that fill the shallow basins behind the terrace walls are blue-tinted due to reflected sunlight. Wear shoes with good traction when walking over the terraces - they can be slippery wet.